Almost every telugu person must have known and read about Sri Krishnadevaraya. You all know that his rule was considered the golden age of Andha. he said the famous words "దేశ భాష లందు తెలుగు లెస్స". Good post... felt happy reading. Great contributions. May God bless you for this wonderful work. 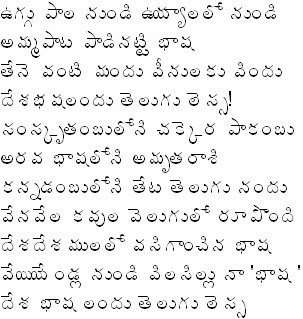 "Desa bhasha landu telugu lessa" is nice post. but as my grametic knoledge there is a mistake in 'chandassu'. desha bhasha landu telugu lessa"
What Sir I sent one comment but it is not displayed that padhyam of Sri Krishna devaraayaa....? Good one.. Thanks for sharing. Among all the languages Telugu is Superior"
Being a Kannadiga we all praise Telugu s uniqueness.